Just what is the real story behind UFOs? Many people believe that extraterrestrials or aliens from space have been visiting this planet for centuries, travelling in space craft that have been referred to as Flying Saucers and more recently as UFOs—Unidentified Flying Objects. The governments of this world reject this theory claiming that most sightings can be explained by meteorological phenomenon or something else. However, so many reliable witnesses have come forward with amazing stories that it makes one wonder just what is going on. The cultists, those who follow and believe in the phenomenon whole-heartedly, want the doors thrown open and the governments of the world to admit to years of hiding the truth from people; that some form of extraterrestrial contact has already occurred and that maybe even alien technology is already being utilized or studied for adaptation for use in this world. "There is a small group of people on Earth ... they are the Universal parasites! Disturbers, negative elements; soon they will be eradicated. ... we will not have them disturb our preparations and plans for the Earth planet." On the other side, the rationalists and religionists debunk the whole thing as bogus. The rationalists consider it a bunch of fairy tales; the religionists with a warning that the phenomenon smacks of demonology or the devil and his angels in a massive deception being perpetrated on the whole world. John Keel, author of UFO's Operation Trojan Horse, spent 4 years investigating the phenomenon in the 1960s. He travelled across many states in the USA interviewing thousands of people who claimed to have seen something or who had received messages from the ufonauts (the entities claiming to be the space aliens flying the UFOs). At first John wanted to find support for the hypothesis that the UFOs were extraterrestrial vehicles bringing space aliens to this planet. But he abandoned this theory in 1967 after finding so much evidence pointing in a different direction. For John, the turning point probably came while investigating the prediction of a disaster that would happen in December of 1967. He found that not only were the warning messages being received by UFO contactees all around the world, but that mediums, telepaths, and sensitives were also receiving the same identical messages. Spirit entities were talking through Ouija boards giving the same messages. These messages were all phrased similarly, whichever language was used. John was forced to conclude that all of these people had to be tuned into a central source. This meant that the UFO entities and the spirit entities were all part of the same gigantic system! Enough messages have been received from the space people to fill a whole library. John also found that though the communicators claim to be extraterrestrials, the contents of their messages appear to be identical to messages received by mediums and mystics. Also the majority of the messages from the space people appear to be riddled with Bible quotations. It leaves one with the very strong impression that there must be some sort of weird connection between UFOs and the Bible. This must be disturbing for those who would like to get rid of the Bible completely and embrace an extraterrestrial approach to universal salvation. John early found that there was some deception being worked with the UFO entities. He found that the phenomenon gave the impression of being a covert military operation with patterns and occurrences of incidents such that it all seemed to be done deliberately. The UFO entities appeared to be following a carefully planned script in order to confuse and deceive. 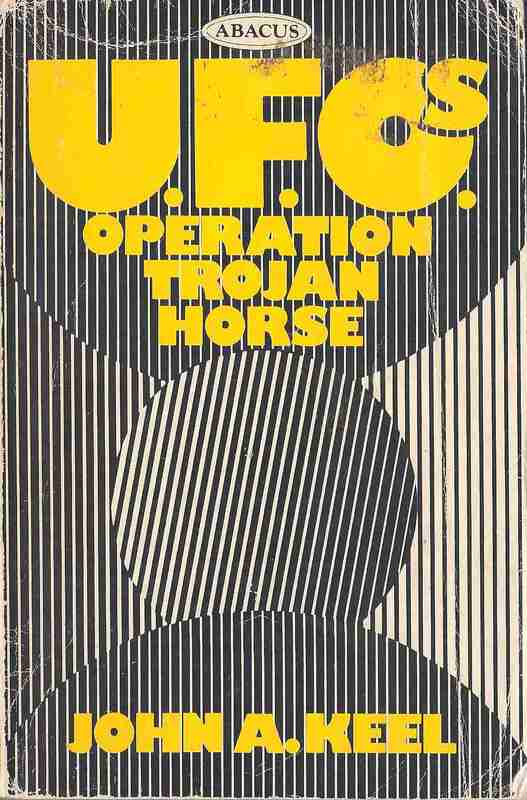 John eventually came to believe that the UFOs concealed hostile intent, and completely at a loss to determine what their end-time objective really was, he decided to label the whole plan “Operation Trojan Horse.” If anyone has had any trouble with a trojan program on their computer they will understand that this term is not a good one: it hides malicious intent. 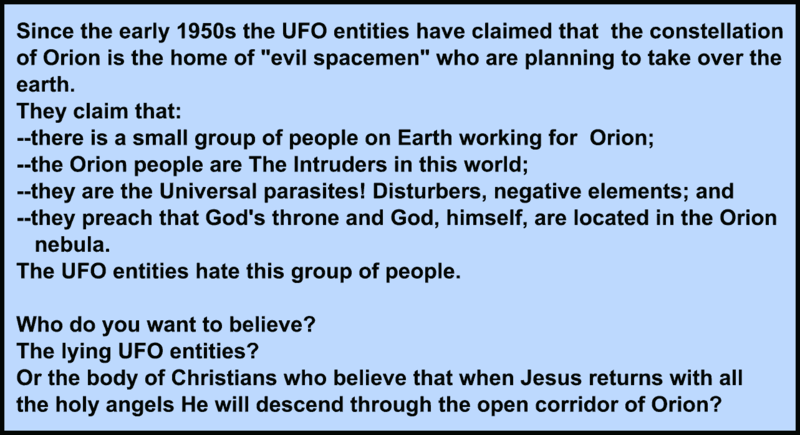 The religionists have been aware of this for many years; that the UFO phenomenon is most likely evil and working to a plan that is not good for the human race. One of the hidden agendas of Operation Trojan Horse involves a deception that will take in the whole world and many Christians have been aware of this part of the plan for quite a few years. Recently another hidden agenda of Operation Trojan Horse has come to light. Hidden in some UFO communications a message has been found that reveals that another part of their plan is the complete eradication of one group of Christians throughout the whole Earth! These two findings, one involving world-wide deception, and the other the complete eradication of one Christian group, shows that the suspicion of hostile intent is correct. The human race is actually at war with the UFO entities and the battle lines have been drawn. Why all the deception and confusion? Why are so many "extraterrestrial" communications riddled with Bible quotations? And why in the world would the UFO entities want the complete eradication of one specific group of Christians? Just what is the real story behind UFOs? * Not to be confused with the pyramid theory proposed by Robert Bauval and Adrian Gilbert in their book The Orion Mystery: Unlocking the Secrets of the Pyramids. This appears to be referred to as the Orion Hypothesis also. Just what really is the UFO phenomenon all about? The following story gives a very big clue and it will be very surprising to many people! The Danish group waited through the night in their bomb shelter for the end of the world. Obviously nothing happened. The following day, the American press ridiculed the Danes, but meanwhile, Mr Weiking had received a message which explained it all. What was the message? I told you two thousand years ago that a time would be given and even so I would not come. If you had read your Bible a little more carefully, you would have borne in mind the story of the bridegroom who did not come at the time he was expected. Be watchful so that you are not found without oil in your lamps. I have told you I will come with suddenness, and I shall be coming soon! A clear reference to the second coming of Christ! Is this what the UFOs are here for?—to warn the world to be ready? A leading spiritualist in England has actually recorded a voice claiming to be from a UFO—the sweetest voice you ever heard. And what did it say? My little children, I am about to return according to my promise. Well, Jesus did say He was coming back again one day; "... I will come again ..." John 14:3. Is He speaking to us from UFOs? Will He one day step out of a UFO? The extraterrestrials (those claiming to be in control of the UFOs) would have us believe so. Their messages support this. And it appears impossible to avoid some sort of connection between UFOs and the Bible. Countless books have been written about UFOs and the Bible. Why? They both refer to the second coming of Christ. And prophecy plays a big role in both. In May of 1967 UFO contactees were told to expect a large power failure. On June 5 in the northeastern United States a massive power failure did occur. Other prophecies were given, with New York City to slide into the ocean on July 2. An interesting point here is that trance mediums and automatic writers were also receiving the same messages. Sometimes the phrasing was identical. John Keel (author of UFO's Operation Trojan Horse, hereinafter referred to as OTH), who was researching the phenomenon at the time, found the predictive element staggering. A three-day nationwide power failure. The Pope to visit Turkey and be assassinated. Some predictions were coming true and he got worried. He eventually drove to Long Island to await the assassination and blackout, taking with him three-quarts of distilled drinking water, thinking it would be handy during the blackout. Along the way he received a message through a contactee—who had been given it from a UFO entity. "Tell John we'll meet with him and help him drink all that water." OTH, p. 276. The contactee knew nothing of John's purchase. But the Pope was not assassinated and John was stuck with all that water. Still the predictions continued. During October a UFO entity gave the message warning of a disaster to occur on the Ohio River. Also when Lyndon Johnson turned on the Christmas tree lights something big was to happen. He also learned that people were having dreams of a river disaster and drowning people. During his visit to Point Pleasant, Virginia, he had stories related to him about monsters and ghosts, and he saw more eerie lights in the sky. On December 11 a mysterious caller said there would be an air disaster in Tucson, Arizona. The following day a jet crashed into a shopping centre in Tucson. John Keel watched the tree-lighting ceremony on television with some friends. Thirty seconds after the switch was pushed, an announcer cut in with a news flash—"A bridge between Gallipolis, Ohio, and West Virginia has just collapsed. It was heavily laden with rush-hour traffic." Christmas packages were floating in the dark waters of the Ohio. OTH, p. 278. A few hours later, the Prime Minister of Australia disappeared. Also the same weekend, a number of explosions occurred in Moscow. Both of these events had been predicted. This is the tiger behind the door of prophecy. Some of the predictions are unnerringly accurate; so precise that there are no factors of coincidence or lucky guesswork. The ultraterrestrials or elementals are able to convince their friends (who sometimes also become victims) that they have complete foreknowledge of all human events. Then, when these people are totally sold, the ultraterrestrials introduce a joker into the deck. They had me buying distilled water and fleeing to Long Island in the summer of 1967, fully convinced that Pope Paul was going to be assassinated and that a worldwide blackout was going to punish the world for three terrible days. OTH, p. 278. Some of the entities were evil liars. The thousands of contacts with the entities indicate that they are liars and put-on artists. OTH, pp. 283, 299. Meanwhile, mediums, telepaths, sensitives, and UFO contactees throughout the world were all reporting identical messages. There was definitely going to be an unprecedented event on December 24, 1967. Ashtar was talking through Ouija boards to people who had never before heard the name. Another busy entity named Orlon was spreading the word. The curious thing about these messages was that they were all phrased in the same manner, no matter what language was being used. They all carried the same warning. Many predictions of the December twenty-fourth disaster had been documented well in advance of that date. These messages came through in many different countries, from people who had no knowledge of or communication with one another. The UFO contactees received the same identical messages as the trance mediums communing with spirits. A link had been established. It was now clear (to me anyway) that all of these people were tuned into a central source. My earlier speculations seemed true—the UFO entities and the spirit entities were part of the same gigantic system. ... Some of the entities were evil liars. OTH, pp. 282, 283. Thousands of mediums, psychics, and UFO contactees have been receiving mountains of messages from "Ashtar" in recent years. Mr. Ashtar represents himself as a leader in the great intergalactic councils which hold regular meetings on Jupiter, Venus, Saturn, and many planets unknown to us. But Ashtar is not a new arrival. Variations of this name, such as Ashtaroth, Ashar, Asharoth, etc., appear in demonological literature throughout history, both in the Orient and the Occident. Mr. Ashtar has been around a very long time, posing as assorted gods and demons and now, in the modern phase, as another glorious spaceman. OTH, p. 230. If this account is true, then it may clear up many questions that people have about the UFO phenomenon. The Bible warns us of lying wonders and miracles and sights and signs in the heavens in the last days. Who do we believe? Evidently the UFO communications cannot be trusted. They claim that all the miracles of the Bible can be explained away by UFO manifestations. Jesus went away in a UFO. And so on. But if the UFO entities are evil liars then we certainly can't believe them and this may be a very dangerous deception! Perhaps it just might be worthwhile to see what the Bible itself says about these things! If the Bible is really up-to-date then the answers will be there! but they were defeated, and there was no longer any place for them in heaven. The great dragon was thrown down, that ancient serpent, who is called the Devil and Satan, the deceiver of the whole world--he was thrown down to the earth, and his angels were thrown down with him. ... there is no truth in him. When he lies, he speaks according to his own nature, for he is a liar and the father of lies. These are demonic spirits, performing signs, who go abroad to the kings of the whole world, to assemble them for battle on the great day of God the Almighty. The Greek word σημεῖον, sēmeion, translated as signs in this verse can also mean miracles and wonders.1 Other versions give spirits of devils or demons, working or performing miracles. Remember also that Revelation 12:9 mentioned that Satan is the deceiver of the whole world! Miracles or signs. Not tricks. Lying wonders? The whole world deceived! And all the power to be able to do this! Certainly the UFO phenomenon fits this like a glove. People are being deceived—all over the world! UFO entities talking through people? It certainly does look like these are just the same lying spirits or devils or demons that Jesus encountered in His day! For he had said to him, "Come out of the man, you unclean spirit!" Then Jesusd asked him, "What is your name?" He replied, "My name is Legion; for we are many." As we noted above, the UFO entities will speak through people and answer questions put to them—just like the unclean spirits in Jesus' day—for that is exactly what they are! The endless messages from the space people would now fill a library, and while the communicators claim to represent some other world, the contents of those messages are identical to the messages long received by mediums and mystics. OTH, p. 183. The messages that have been received by mediums and mystics are from spirit entities. Again reinforcing the premise that the UFO entities are really just the same spirit entities that have been troubling the human race since the beginning of time. They are not space aliens visiting this planet in space craft as they would have us believe. They were all amazed and kept saying to one another, "What kind of utterance is this? For with authority and power he commands the unclean spirits, and out they come!" And Christians who give their lives to the Lord may be protected. But those who do not have no defense. There were some in the apostle Paul's day who tried to command these fallen angels by the name of the Lord Jesus. What happened? But the evil spirit said to them in reply, "Jesus I know, and Paul I know; but who are you?" Then the man with the evil spirit leaped on them, mastered them all, and so overpowered them that they fled out of the house naked and wounded. They were probably lucky. These fallen angels are dangerous. Many people have been hurt by UFOs. The number of people killed is probably unknown. This comment should now make a lot of sense. For clearly there is nothing scientific in this world that can be used to evaluate UFOs. We are dealing with something not of this world. Not that the ufonauts are what they say they are. They are not extraterrestrials visiting this world in spacecraft as they would have us believe. There is only one thing in this world that can be used to properly evaluate the phenomenon—and that is the Bible. And that only because it is exactly what it claims to be—the Word of the Living God who knows the end from the beginning. It is likely that an outsider trespassing on the scene of a UFO contact would see the contactee standing in a rigid trance. The elementals or ultraterrestrials are somehow able to manipulate the electrical circuits of the human mind. They can make us see whatever they want us to see and remember only what they want us to remember. OTH, pp. 271, 302. Well, if Satan and his fallen angels are deceiving people by having them believe that Christ will come in a UFO and that all the miracles of the Bible can be explained by UFO activity, then just what other options do we have? The UFO entities are evil liars. Perhaps it just might be worthwhile investigating what the Bible does say about the second coming of Jesus Christ! ... as they were watching, he was lifted up, and a cloud took him out of their sight. ... they were gazing up toward heaven, ... 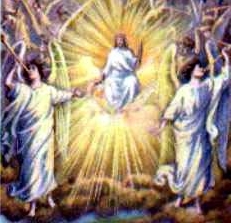 This Jesus, who has been taken up from you into heaven, will come in the same way as you saw him go into heaven. But this last verse also tells us that every eye will see him. Some believe that He may appear here and there to only a select few. But Jesus Himself told us not to believe this! So, if they say to you, 'Look! He is in the wilderness,' do not go out. If they say, 'Look! He is in the inner rooms,' do not believe it. For the Lord himself, with a cry of command, with the archangel's call and with the sound of God's trumpet, will descend from heaven, and the dead in Christ will rise first. Then we who are alive, who are left, will be caught up in the clouds together with them to meet the Lord in the air; and so we will be with the Lord forever. Other translations give the cry as a shout. Obviously it will be a loud cry. A shout and the sound of the trumpet means that it will be a very loud event. Now these verses also give some other very important information. Firstly, that the dead in Christ are raised to immortal life. Those alive of Christ's, are also taken up to be with Him. Also a very important point is that the Lord is in the air. Now this may not seem very important, but it is. It actually tells us that the feet of Jesus will not touch this earth at His second coming! So anyone claiming to be Christ walking on this earth will not be the true Christ at all. Jesus will stay in the air when He comes! So when Jesus comes, all the unfallen angels attend Him and gather the saints to Him. Now this is obviously what Satan and all his fallen angels don't want known so they have tried to deceive people many ways. One way is to manufacture a UFO phenomenon with messages that Jesus will come in a UFO. Do the ultraterrestrials really care about us? There is much disturbing evidence that they don't. They care only to the extent that we can fulfill our enigmatic use to them. OTH, p. 247. Let us instead put our faith in a Loving God who wants us all home with Him, and not in the fallen angels whose only interest is in tricking us and leading us astray. In modern UFO-contactee lore, beginning in the early 1950's, the constellation of Orion is frequently cited as the home of "evil spacemen" who are planning to take over the earth. A famous British contactee, Arthur Bryant, claimed that on April 24, 1965, a UFO occupant informed him that "forces from Epsilon are already here in the form of poltergeists." Epsilon Orionis is the central star in the belt of Orion. OTH, p. 190. OTOF, pp. 44, 61, 67, 91, 186. The space visitors told Isaiah to go and tell the people ... some people were taken by space craft to a safer place. Anyway, the quotes are from CHAPTER 6 which has the title THE INTRUDERS. This chapter appears to have a lot to say about Orion. Read this carefully—you will see that these lying entities even quote scripture! My sabbath-keeping Christian companions take special note! We must tell you about Orion. Many there wish to conquer the Universe. ... Orion systems want to destroy—remember, Orion is evil (negative). OTOF p.501. Orion ... is now attempting to interfere on Earth. ... evil influence ... OTOF p. 503. Orion's ... Confederation of Evil. OTOF p.504. The negative space intelligences from Orion ... "Orion" is used by space visitors to indicate the general area from which the evil influences originate. OTOF p.506. the evil destroyers ... migrated to Orion in spiritual form. OTOF p.510. The ancient inhabitants of Mesopotamia and India knew that Orion's early rising portended storms. Even today, this section of Creation is a stormy section—one that seeks to conquer, to subdue. OTOF p. 513.
the evil (negative) Orion ... OTOF p. 513. Orion disturbs other planets and keeps them from operating in the correct manner. ... Orion interferes and holds back. People of Orion are not our kind of people, they do not belong to our Confederation. They interrupt and are unruly. At present time there is a small group of people on Earth working for Orion. ... They come among you to disperse all things not in keeping with their own ideas; they upset our plans. ... They prey on the unsuspecting; they are talkative; ... OTOF p. 514. We have our own men who watch over these pirates of Creation. They have their own Council and the Orion Confederation; but they know little through their own ingenuity for they are the Universal parasites! Disturbers, negative elements; ... The Orion people are The Intruders in your world ... we will not have them disturb our preparations and plans for the Earth planet. OTOF p. 515. Watch for them; their numbers increase as the "sorrows" of Earth increase. They will persist, but they will not succeed—but we will succeed, for our mission is of the Father's authority and His will shall prevail. Worry not about these Orion influences; they cannot harm those who serve the Infinite Father. Pity them, love them, pray for them, for they know not what they do! OTOF p. 516. This is the pattern of The Intruder—to disrupt, cause dissension, strife, trouble, interfere! OTOF p. 526. This book also gives many quotations from the Bible to support its premise. Again, it is interesting that UFOs CANNOT be separated from some connection with the Bible! For those who would rather do away with the Bible completely and embrace an extraterrestrial approach to universal salvation, this observation must be very disturbing! And what about these quotations above from OTOF? We know that the UFO entities are evil liars and we probably couldn't believe anything that they say but it is curious that they seem to have a strong enmity against Orion. This has come through a few sources here so there is something definitely going on. UFO ENTITIES' HIDDEN AGENDA FOR EARTH FINALLY REVEALED! Note: to fully understand this needs some of the previous quotations so the page-link for this is actually above. If somehow you have jumped or scrolled straight to here you really need to go back and read from the POSTSCRIPT [click this will take you there]. John Keel believed that the UFO phenomenon "smacks uneasily of a covert military operation." The patterns and occurrences of certain UFO incidents are such "that we must wonder if they aren't really deliberate." The UFO entities appear to be following a script of "carefully planned confusion and deception." They appear to "set up a careful smokescreen to cover their real activities." Like "the original Trojan Horse, they seem to conceal hostile intent. ... This hostility theory is further supported by the fact that the objects choose, most often, to appear in forms which we can readily accept and explain to our own satisfaction." OTH, pp. 27, 64, 78, 94, 167. John Keel, completely baffled about the hidden agenda that the UFO entities were working to, decided to call this plan, Operation Trojan Horse. Or in his own words, "I call that something else Operation Trojan Horse." On the repair gambit, John states that "it seems as if the ufonauts are following a carefully rehearsed procedure." OTH, p. 167, 178. Talking about the centuries of UFO events occurring in similar geographic locations and the concentration of activities through certain days of the week, John makes the comment: "These facts in themselves are proof that the phenomenon is guided by an intelligence and that the individual events form part of a larger plan." OTH, p. 195. So there is some hidden plan the UFO entities are working towards! Again, discussing the complete muddle of communications from the contactees, John states: "No, the real truth lies in another direction. The contactees from 1897 on have been telling us what they were told by the ufonauts. The ufonauts are the liars, not the contactees. And they are lying deliberately as part of the bewildering smokescreen which they have established to cover their real origin, purpose, and motivation." OTH, p. 213. Italics in text. This study has shown the exact origin of UFOs, well at least where the entities are from, and they are the ones responsible for the UFOs themselves. As we would expect, John Keel has clearly shown that the UFOs conceal hostile intent. The entities are working to some hidden agenda that is not good for the human race on this planet. Though John never really did figure out exactly what that final goal is, it is actually possible to piece a large part of it together from some of the above quotations [and some others]. This hidden agenda is exactly what Operation Trojan Horse is really all about. We are told that the UFO entities have "preparations and plans for the Earth planet," and that they "will succeed." However, they complain that "there is a small group of people on Earth working for Orion" who "upset our plans." These people "of Orion are not our kind of people, they do not belong to our Confederation." OTOF, pp. 387, 388. In fact, so upset are the entities that they refer to these people as The Intruders in this world, those who interrupt and upset their plans, are Universal parasites, pirates of Creation, disturbers and negative elements, and are those who disrupt, cause dissension, strife, trouble, and interfere! A very interesting mixture of appellations indeed! These people get the universal execration of disapproval from the UFO entities themselves! Just who are these people? Would you like to have a guess? In Florida there is a minister who claims the world is about to end, but he will sell any interested party a piece of land in the vicinity of Orion for a few dollars. How does he expect to get the buyers from the doomed Earth to Orion? And if the Earth is going to end, why does he want to accumulate the ready cash? Again, the word "Orion" gives him away. He is under negative control! As I said, at first reading this quote just doesn't make sense. But personally I think that is because the UFO entities have twisted what is happening here. Why would any Gospel minister sell anyone land in the vicinity of Orion? It doesn't make sense. But inviting people home to heaven does make sense to a Christian. If you believe that Jesus will come down through the open corridor of Orion and take His people back to heaven the same way then this begins to make sense. The "piece of land" in the vicinity of Orion is Heaven! Sell? No, this is a twisting of the entities. They probably are complaining that people may have been asked for donations at the church gathering. It is Biblical to give offerings and the Bible even refers to giving a tithe. There is no sin in this and the minister is not interested in accumulating wealth. The Bible is clear that those who minister are to be supported. And how does he expect to get the "buyers" from the doomed earth to Orion? Any Christian can answer that question—well those Christians that believe in the Orion hypothesis. In The Saucers Speak! 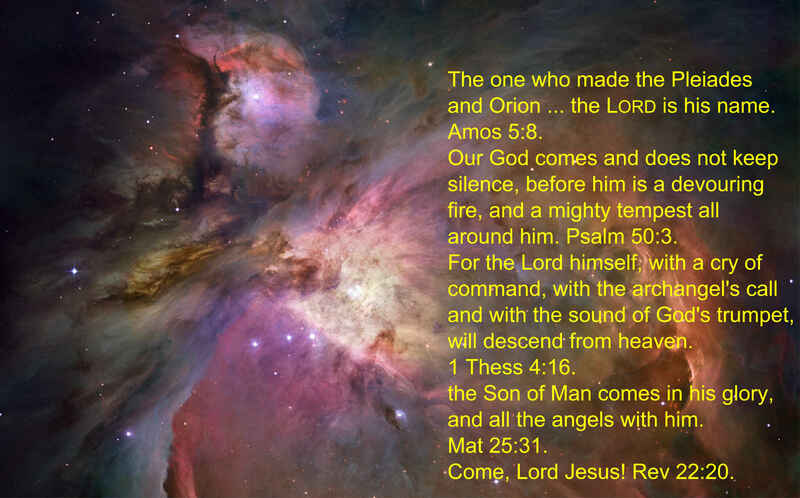 a Wyoming evangelist is quoted as saying that God's throne and God, himself, are located in the Orion nebula. Once again, the word tells the story. He preaches that the Flying Saucers are piloted by fork-tailed devils—another Intruder! OTOF, p. 526. Ignoring the silly comment about fork-tailed devils—yes, we have another Christian. An evangelist; and a direct reference to this person believing that Orion is the gateway to Heaven [or location]. Heaven is where God and His throne are. The entities are saying that because this person believes in the Orion hypothesis, he is an Intruder! Note: this is one of the Ten Commandments which were written on tables of stone by the finger of God and given to Moses on Mount Sinai. This is God's Holy Law which was meant for all people for all time in this world, not just the Jews. The seventh-day sabbath corresponds to our Saturday, or more correctly, from Friday sunset to Saturday sunset. There are many Christians who keep this day of worship instead of Sunday. A very important point that also lends very strong support to the premise of this all pointing to seventh-day sabbath-keeping Christians is the last chapter of George Williamson's book. The last chapter of his book is titled "THE REMNANT"!! And guess what, it starts off with a Bible verse! Well the main body of seventh-day sabbath-keeping Christians have been proclaiming for years that they constitute the true remnant of Bible prophecy! And here we have these lying UFO entities giving their slant on this. Who do you want to believe? People of Orion are not our kind of people, they do not belong to our Confederation. ... At present time there is a small group of people on Earth working for Orion. ... They have their own Council and the Orion Confederation; ... their numbers increase as the "sorrows" of Earth increase. They will persist, but they will not succeed—but we will succeed, for our mission is of the Father's authority and His will shall prevail. Worry not about these Orion influences; they cannot harm those who serve the Infinite Father. Pity them, love them, pray for them, for they know not what they do! OTOF, pp. 514-516. Emphasis mine. The sorrows of Earth? Our mission? The Father's authority? The Infinite Father? Pity, love, pray??? These are very strong religious sentiments!!! Do I need to comment on "for they know not what they do"? These UFO entities are religious in nature by what they are saying! So think the following through very carefully!! As religious entities they are part of a religious organization and they refer to it as a Confederation. The people of Orion do not belong to their Confederation. They belong to a different Confederation or religious organization. Just how close can we fly with this? It doesn't take too much to ask yourself--are their any church organizations in this world that use this sort of terminology? Confederation or similar. How about Conference? Or General Conference? There are actually a few different church organizations that use this term. And yes, the main body of seventh-day sabbath-keeping Christian believers use this term and refer to their world headquarters as the General Conference!! Note: the UFO entities refer to this as Orion's Confederation of Evil!! And all this from George Williamson's book— hidden in these messages from the UFO entities! So the UFO entities are really upset with seventh-day sabbath-keeping Christians and complain that they are The Intruders, they interrupt and upset their plans, are Universal parasites, pirates of Creation, disturbers and negative elements, and are those who disrupt, cause dissension, strife, trouble, and interfere! Further, the UFO entities claim that "we will not have them disturb our preparations and plans for the Earth planet." OTOF, p. 387. The UFO entities hint that they have something in mind for these people who are causing them all these problems. People of Orion are not our kind of people, they do not belong to our Confederation. ... At present time there is a small group of people on Earth working for Orion. ... they upset our plans. ... We have our own men who watch over these pirates of Creation. They have their own Council and the Orion Confederation; but they know little through their own ingenuity for they are the Universal parasites! Disturbers, negative elements; soon they will be eradicated. ... we will not have them disturb our preparations and plans for the Earth planet. Watch for them; their numbers increase as the "sorrows" of Earth increase. They will persist, but they will not succeed—but we will succeed ... OTOF, pp. 514-516. Emphasis mine. they will also drink the wine of God's wrath, poured unmixed into the cup of his anger, and they will be tormented with fire and sulfur in the presence of the holy angels and in the presence of the Lamb. And the smoke of their torment goes up forever and ever. There is no rest day or night for those who worship the beast and its image and for anyone who receives the mark of its name." Here is a call for the endurance of the saints, those who keep the commandments of God and hold fast to the faith ofs Jesus. s Or to their faith in. and it was allowed to give breathp to the image of the beast so that the image of the beast could even speak and cause those who would not worship the image of the beast to be killed. At this point God's people, those who are faithful to His Holy Law of Ten Commandments, will be threatened with complete extermination. For more information about this incredible battle, see our page The Seven-day Week in Bible Prophecy.
. And of course, for those of you who have read the Bible, you know that in the end, Jesus wins. Well, the UFO entities ARE these demonic spirits! And the Bible says that they will "go abroad to the kings of the whole world, to assemble them for battle on the great day of God the Almighty." According to the Bible this battle will involve an attempt to completely eradicate God's faithful commandment-keeping people from the face of the earth. So the messages from the UFO entities that this is also actually part of their plan comes as no real surprise. But there is more. We can also put together a Part B to Operation Trojan Horse. What's the other big plan that is obvious from the UFO communications? In May, 1967, Knud Weiking, in Denmark received telepathic messages ... At the same time, mediums and psychics and UFO contactees all around the world were receiving similar messages. They were all phrased the same, no matter what the language. ... The Danish group waited through the night in their bomb shelter for the end of the world. Obviously nothing happened. The following day, the American press ridiculed the Danes, but meanwhile, Mr Weiking had received a message which explained it all. What was the message? The space friends have said that they would keep out all the negative forces, but they also said a "square star-body" was coming to Earth. As time goes on, the anti-Christ or negative forces will become more powerful. This is a sure sign of the Second Corning. OTOF, p. 528. I have checked a couple of copies of this book and the typo is the same: "the Second Corning." The anti-Christ is mentioned in this quotation so there is little doubt that the typo is meant to be "the Second Coming" not Corning. The Second Coming is of course, a reference to the Biblical Second Coming of Jesus Christ. The Saucers constitute the "Host" which is the forerunner of the promised "Second Coming" of the Elder Brother. The ORIGIN of the Saucers, however, is not the important consideration—but their MISSION is! OTOF, p. 484. It is also interesting that this quote states that the origin of the Saucers [UFOs] is not important but that their mission is. Not only is their origin very important, but so is the mission. They clearly do not want people studying to determine their origin for this gives their game completely away! This study has shown the correct origin of UFOs and now we are looking at what their mission is for the Earth! The Elder Brother mentioned in the quote is of course, their "Jesus." The Elder Brother, Jesus, said: "Know ye not that ye are Gods?" OTOF, p. 39. The Elder Brother or Christ says He "manifests in Light", and He gives "Light commandments". OTOF, p. 396. Very few ministers are telling their congregations that the Saucers may have a connection with the "signs in the skies" that the prophets of old spoke of. Some theologians, however, believe that the coming of the Saucers heralds the coming of the Elder Brother himself. OTOF, p. 432. ... the imminent return of the Elder Brother. OTOF, p. 435. The UFO communications clearly tell us that "Jesus" is coming. No doubt the plan is to have this "Jesus" step out of a UFO. Well, from the Bible quotes we looked at before, we know that when the real Jesus comes back, he will stay in the air and his feet will not touch this earth. So this "Jesus" who steps out of a UFO will not be the true Jesus at all. But this is clearly a plan that the UFO entities are working toward. We can call this Part B of Operation Trojan Horse. So there it is. Operation Trojan Horse. The hidden agenda. The real plan the UFO entities are working to is to set up a confederation on this planet that is in opposition to the Law of God [the Ten Commandments]. The "small group of people on Earth working for Orion" are God's faithful seventh-day sabbath-keeping people who are faithful to His Ten Commandments and are in direct opposition to the confederation the UFO entities are working towards. They are a small group compared to the teeming billions of Earth's population. Also they are the ones who can point out clearly to people that any "Jesus" stepping out of a UFO is not the real Jesus at all. So the hidden agenda for Operation Trojan Horse is two-fold: to engineer a "Second Coming" of their own with a false "Jesus" stepping out of a UFO, and at the same time the complete eradication of God's faithful seventh-day sabbath-keeping people around the world. So overmastering will be this deception, that the false "Jesus" who steps out of a UFO will deceive the whole world! Then if anyone says to you, 'Look! Here is the Messiah! 'z or 'There he is!' --do not believe it. For false messiahsa and false prophets will appear and produce great signs and omens,b to lead astray, if possible, even the elect. b The RSV gives wonders. But God's faithful commandment-keeping people, His elect, will not be deceived! He is clothed in a robe dipped inl blood, and his name is called The Word of God. And the armies of heaven, wearing fine linen, white and pure, were following him on white horses. On his robe and on his thigh he has a name inscribed, "King of kings and Lord of lords." Then I saw the beast and the kings of the earth with their armies gathered to make war against the rider on the horse and against his army. l Other ancient authorities read sprinkled with. The false "Jesus" who steps out of a UFO will have no power in comparison to the real Jesus when He appears. All the scheming of Satan and the fallen angels, the UFO entities, and any UFOs they want to manoeuvre around the sky will be like firecrackers compared to the real event itself. It's not something talked about much, but according to the above scripture quotation, the armies of earth are actually going to try to make war with Jesus as he descends from Heaven. Can you believe it? They will probably fire missiles and rockets at Him. That's the impression from the Bible. And Satan will most likely have a few UFOs flying around in the middle of all of this too. It won't help. NEW REVISED STANDARD VERSION OF THE BIBLE, 1989. 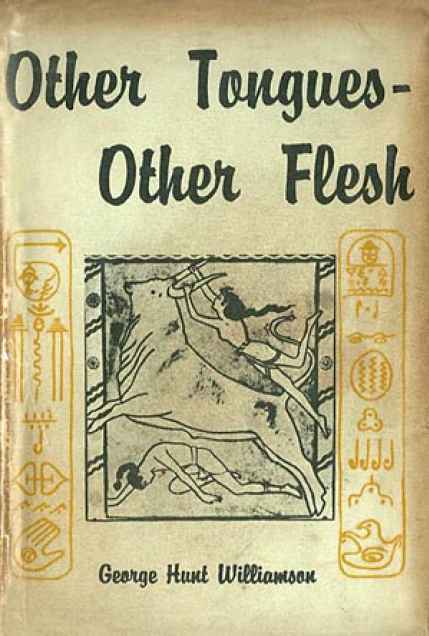 George Hunt Williamson, OTHER TONGUES—OTHER FLESH, 1953, Amherst Press: Amherst, Wisconsin. This book appears to be available in various formats: pdf, epub and directly on the web. There may be others. And they all appear to have different pagination. The pagination given here is for the epub version I have. It is approximate. Whichever version you have, most of the quotes here are from Chapter 6 The Intruders. 1. Thayer's Greek-English Lexicon of the New Testament, 1980, Baker Book House, Grand Rapids, Michigan, pp. 573, 574. 2. UFOs: It Has Begun, 97 min - Documentary - 1976 (USA), Sandler Institutional Films, Inc. This documentary appears to have taken some flack for some possible questionable editing of some interviews. The two used in this study look OK. The Wm.Coleman quote is word for word. The Robert Friend quote has been paraphrased. If anyone wants to check this, I believe that the documentary can be viewed on-line for verification. George Vandeman, Psychic Roulette, Pacific Press Publishing Assocation, 1973. Though not directly referenced some of the early material of this page leaned heavily on George's section on UFOs and John Keel. I did have a copy of John's book but may have moved it on with some other UFO books when I became a Christian. Anyway, with this study progressing it looks like I purchased an identical copy. This copy looks identical to my original paperback copy I purchased back in the 1970s before I became a Christian. Last revised: 16 May 2015.